The Jewish voice in the labor movement, and the voice of the labor movement in the Jewish community. 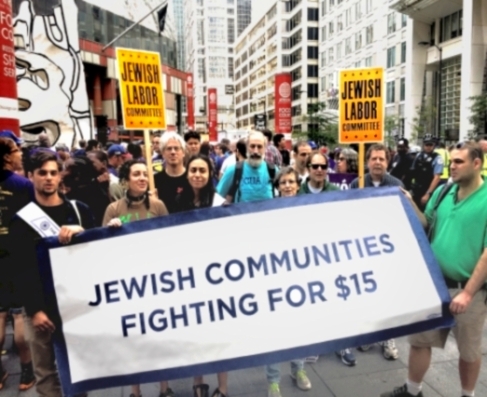 September 4, 2017: Chicago, IL -- Jewish Labor Committee staff and lay-activists joined thousands of union members and other workers fighting for a fair wage and union rights on the job at today’s Fight For $15 Labor Day Rally in Chicago’s Loop. Chicago JLC participated in a Jewish Contingent, along with Chicago’s Jewish Council on Urban Affairs and the Chicago Workmen’s Circle branch. Activists at the rally included Moral Monday founder The Reverend Dr. William J. Barber II, The Reverend Jesse Jackson, former Governor Pat Quinn, and SEIU Healthcare Illinois president Greg Kelley. The minimum wage in Illinois is $8.25 an hour. A bill sent by state legislators to Governor Bruce Rauner in May that would have required the state’s hourly minimum wage to go up to $15 over five years was vetoed by Rauner a few weeks ago. Chicago currently has a minimum wage of $11 an hour, which rises to $13 an hour in 2019.